The Michells of Chardstock were a little-known family of clockmakers. Their name is well known but their work much less so. I recently came across an interesting lantern clock signed 'J. Michell Chardstock fec.' On such an occasion my first instinct is to look at the available literature for other examples of work by the same maker for comparison. In fact I was unable to find any example of a Michell lantern clock in any of my books. The late J.K. Bellchambers included the Michells in his book 'Somerset Clockmakers' in 1968, where he described John and James Michell of Chard and Chardstock as two brothers, whose names appeared on late seventeenth century lantern clocks. Another source of information was the 1981 book 'Dorset Clocks & Clockmakers' by Tom Tribe and Philip Whatmoor, who on the Michells mainly quote from some notes of the 1920s by the Reverend Bartelot. Chard and Chardstock are villages only about three miles apart yet I found them tricky to pin down. I was intrigued as to why Bellchambers put Chardstock in Somerset when Tribe and Whatmoor put it in Dorset. Well, it seems that Chard is in Devon, whereas Chardstock was originally in Dorset but was moved by boundary changes into Somerset, then later into Devon - which is why it is also included in Clive Ponsford's 1985 book 'Devon Clocks & Clockmakers'! Clive Ponsford quotes from F. J. Britten's 1911 edition of 'Old Clocks and Watches and their Makers' (who also illustrates a drawing of a Michell fret) 'J.Michell of Chardstock, a village in Somerset, was an excellent maker of lantern clocks about 1700 and judging from the number of specimens still existing, he must have had a considerable connection. His frets were good and bore a distinctive character … Michell was succeeded by the family of Drayton, of which several generations successively carried on the business'. It was a source I had overlooked as I can never get to grips with the varying editions of Britten, where new names seem to appear and old ones to disappear with no obvious pattern. Britten quotes 'J. Michell' in his text but 'Jo. Michell' in his index, presumably short for John. Clive Ponsford also quotes a sighting by a local historian named Tapley-Soper, who recorded a lantern clock signed 'John Michell Chardstock fecit'. I know of two lantern clocks, one signed 'J.' and the other one 'Jo. ', which I assume to refer to John. I have not personally come across one by James Michell, but Tribe and Whatmoor mention one signed by James. Based on Bellchambers's statement that they were brothers, Tribe and Whatmoor seem to have searched for, and indeed found, two brothers with these names at Chardstock, but from newly-uncovered evidence it would seem that these two Michell brothers were NOT the clockmakers. I recently traced the will of John Michell, 'clockmaker', and by tracing the baptisms of those children he mentioned in his will, I was able to find what I think is the correct John Michell. John Michell appears not to have had a brother named James, and the existence of two clockmaking brothers so named seems to have been an assumption by Bellchambers. We cannot be sure about this, as early researchers like the late Jack Bellchambers sometimes found unspecified sources of information we are unaware of, but that's the way it seems to me. John Michell did have a son named James, and if indeed there are lantern clocks signed by James, it may be that they were the work of John's son. James was the first-born child (baptised in February 1688) of John, who married in January 1686 to Elizabeth Markes at Wambrook, a village close to Chardstock. Nothing else has come to light about James from parish registers, but that could well be the case if he remained a bachelor, which is what may have happened. It is quite probable that, as the eldest son, James would follow his father's profession, probably working for his father and perhaps not making clocks in his own name till the father's death in 1732 or 1733. Until we see a clock by James, we shall not know. A very fine eight-day longcase clock of London quality dating from about 1710 and made by John Michell is pictured in Clive Ponsford's book. He rightly points out that this is exceptional work for a village clockmaker. Was John perhaps trained in London? I doubt it. He was born in 1669, son of another John and his wife Jane of Wambrook, near Chardstock, and was married there at the age of only seventeen, which could have left at most only three years to learn any trade, as an apprentice was not allowed to marry during his time. We have to assume he was earning a living by then (1687). We do not know the trade of his father, John Michell senior, of Wambrook. It is just possible he too was a clockmaker. 1. 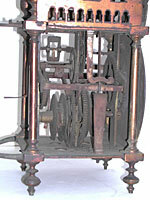 Lantern clock by J. Michell of Chardstock pictured unrestored. Integral pillars of exceptionally decorative nature. Ornate galleried fret. Matted dial centre. Formerly verge pendulum, now anchor escapement. Date about 1700-1710. Of course James may have moved away from Chardstock. There is a sparse record of a James Michell working in London about 1710, based on the sighting of a single clock. Could it have been that James Michell tried his hand at clockmaking in Chardstock but later moved to London? In 1710 James would be about twenty three, his father, John, back in Chardstock would be about forty one. Could it be through the London contact with his son James that John was able to supply a London-style clock to a Chardstock client? Much of this is speculation and we may never know the answer. If John Michell is a bit of a mystery, then James is much more so. On the question of the London style of the longcase clock mentioned above, dating from about 1710, there is an interesting and puzzling entry in the records of the Clockmakers' Company of London in 1673 when one 'Mr. Michell' paid the company search fee. The search fee was a levy charged when the Company officers carried out a periodic search of trade premises to check for any faulty work. No Mr. Michell (or Mitchell) was a member of the Company at that period, nor is there any known London clockmaker of that name. There is no further reference to this person, just this one entry in the records, which implies he may have been working there only temporarily. If this 'Mr.' Michell was one of the Chardstock family, he could only have been John the father, as John junior was only four years old at the time. This might just explain the London connection. However I also have a reference to a lantern clock by one John Michel of Bath, Somerset, dating from the vague period 1670 to 1700. Common sense tells me there cannot have been another maker of lantern clocks with the same name working at the same time not that many few miles away. So my guess is that the Bath maker was John junior (or senior?) later working at Chardstock. In Bath and nearby Bristol he would have had contact with the most fashionable clockmakers in the South West, who in turn were in regular contact with London. In fact from the evidence of the two Michell lantern clocks I have seen, it is apparent that they followed the distinctive stylistic trends of Bristol, showing they probably had contact with trade suppliers there, such as brassfounders, and that they were familiar with the most sophisticated and fashionable styling of lantern clocks made there. The Michell lantern clocks are very different from those made in London, which might imply the London connection was only occasional or fleeting. John Michell senior was recorded at Whambrook in 1669 and 1671, when two children were baptised there. Beyond that we know nothing about him. We know more about John Michell junior, who had at last eleven children, not all of whom appear to have survived. The eldest, as I have said, was James, born in 1688, the last probably being Anne, born in 1706. John's will was written in February 1732, in which he described himself as "of the parish of Chardstock in the County of Dorset Clockmaker being weake of body but of perfect and sound mind and memory". The clerk wrote his name as both Mitchill and Mitchell but John signed clearly Michell, the same spelling as on his clocks, which implies he was insistent on it even if others got it wrong. He left everything to his youngest daughters. If his other daughters or sons survived, he makes no mention of them. Elizabeth was then single but married later, before the will was proved (in 1733) to John Rounsevell, whom she survived till her own death in 1766. Katherine, born in 1700, had married in 1727 to Richard Rose. But the interesting aspect was his bequests to his daughter, Anne, wife of Thomas Drayton, and her infant daughters Betty and Mary. Anne is the interesting one as she is said to have eloped with the vicar's son. The Rev. John Drayton was Vicar of Chardstock in those days. His son, Thomas, fell in love with Ann, the daughter of John Michell, the clockmaker, and they eloped and were married at Dorchester September 7th 1727. Eventually Thomas Drayton took on the clock business at Chardstock and he was buried at that parish June 6th 1788 aged 73. His son, James Drayton, born 1742, was also a clockmaker, who removed to Chard and started there a flourishing clock and watchmaker's business, in which he was succeeded by his son, Thomas, born 1768." 2. The hammer spring is finely shaped and filed, and the hammer stop file-decorated. The clock is in very dirty condition, probably not have been cleaned for over a century. Another source gives Thomas's age at death as 75, so on that basis he is calculated as either twelve or fourteen years old when they married in 1727. This seems highly unlikely. We know the bride was twenty one. Thomas's age at death was probably a mistake, although we can assume he was quite young at the time of his marriage. I have not traced his actual baptism. Anne's father, John Michell, must have been furious, but as he himself had married at the age of seventeen, he was hardly on firm ground. No record of apprenticeship has been traced for Thomas Drayton, though we know he succeeded to the Michell business. Thomas Drayton would have known Ann Michell by virtue of living in the same village. But it is possible he was already training as an apprentice under Michell at the time he and Ann eloped. Otherwise we have the odd situation that John Michell forgave them and took into his business someone totally untrained in the work, who just happens to have run off with his daughter! But there is another possibility, which may mean that John was never reconciled with his daughter and family till on the point of death. The two Drayton children, Betty and Mary, mentioned by John Michell in his will in 1732, seem not to have been baptised locally. Could it be that Thomas and Ann lived elsewhere after eloping, only returning to Chardstock when Ann and her children were left property there on her father's death in 1733? In that case Thomas was presumably working for another clockmaker in some other town in this interim period, despite his young age. They certainly lived at Chardstock by 1742, when son James was born, later to become a clockmaker himself at Chard by the 1760s. Ann died tragically young in 1744 aged thirty eight, and Thomas married again in 1746 to Elizabeth Rocking, who presumably reared his young children. The Drayton family of clockmakers certainly succeeded John Michell, but just how this came about and the full story behind the 'elopement' may never be known. John Michell's lantern clocks are unusual. They feature exceptionally ornate pillars of the integral type (feet and finials all in the one piece), as used by makers in the Bristol area. His dial centres are matted rather then being engraved, as most were, and that is very unusual for lantern clocks anywhere. One of the two clocks I have seen one is grander than the other and has very ornate galleried frets of the type shown in the sketch in Britten, yet of a different pattern. Galleried frets were usually restricted to lantern clocks of a grander nature, such as quarter-chiming ones, but some makers used them for their 'superior' models, which is presumably what John Michell did. In view of their matted centres it is difficult to understand Bartelot's remarks about their engraved dials being so fine. Perhaps the two I have come across are not typical, though even on those the engraved frets are particularly good and unusual. I found what seems to be the marriage Bartelot refers to of Philip Levermore to Elizabeth Estmond, which took place at Whambrook, next to Chardstock, on 26th January 1687. He seems to have been born in Honiton in 1648, son of Philip Levermore senior. We therefore know he was at Chardstock by 1687, a date which tallies with the 1685 death of his father and the 1687 marriage of John Michell. Certainly Michell and Levermore must have known each other, both being married in the same church in the same month of January 1686 (which we would now refer to as 1687 new style). These factors come together to suggest he could have been engraving for Michell from 1685 or 1687 till his death in 1699. John Michell may have been the only clockmaker we know of to have employed a gentleman engraver, as there can't have been many of those! If the lantern clocks pictured here postdate 1699,as they seem to by their style, then perhaps Michell used matted centres, which he could do himself, because he had lost his engraver. As with so many of these aspects of early clocks and the lives of their makers, the more we discover, the more we realise is still unknown. There is probably still more undiscovered about John and James Michell than we already know, but at least we have narrowed the field a little.